The Congressional Budget Office's (CBO) latest baseline shows that deficits and debt are rising unsustainably, driven by the failure of revenue to keep pace with a $2.6 trillion (2 percent of GDP) increase in federal spending over the next decade. 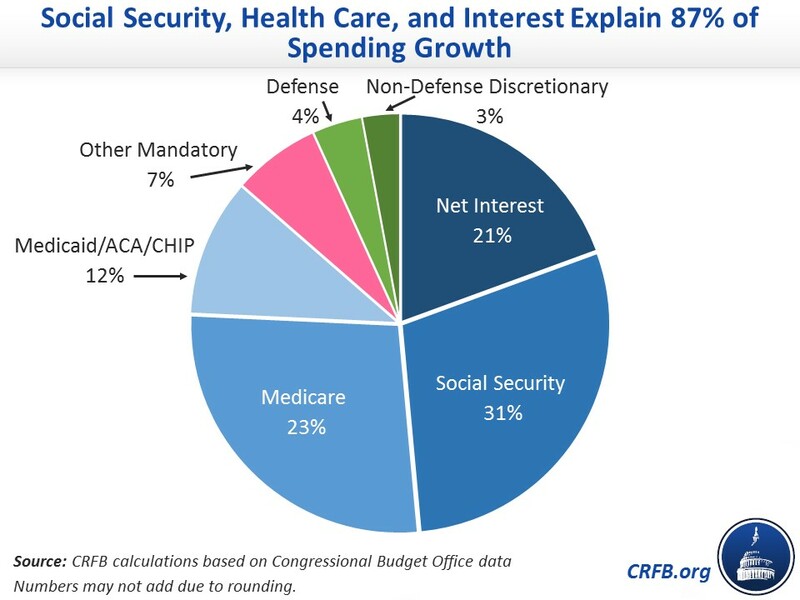 Fully 87 percent of nominal spending growth under current law can be explained by just three budget areas – Social Security, federal health care programs, and interest on the debt. Even if lawmakers extend higher discretionary spending caps as in the Alternative Fiscal Scenario, those three areas of the budget account for 81 percent of nominal spending growth. Of the $2.6 trillion projected increase in spending between 2019 and 2029 under current law, 31 percent is due to the rising costs of Social Security, 23 percent due to the rising costs of Medicare, another 12 percent due to other health care programs, and 21 percent due to rising interest costs. These programs are projected to grow rapidly as a result of an aging population, rising health costs, and increased debt. An aging population both means that there will be a greater number of elderly people eligible for benefits and the population will have more older people, who tend to have more expensive health care needs. Other areas of spending are growing very slowly. Non-health and non-retirement mandatory spending programs – including spending on farm subsidies, federal employee retirement, food stamps, and unemployment – will only account for 6 percent of the total projected spending increase. Meanwhile, defense will make up just 4 percent of nominal spending growth and non-defense discretionary spending – including spending on federal workers, education, environmental protection, the State Department, and many other functions – accounts for 3 percent of spending growth. The modest share of spending growth going to discretionary programs is driven in part by the scheduled expiration of recent massive discretionary cap increases and the return of the sequester-level spending caps. But even under CBO's Alternative Fiscal Scenario, which extends the spending increases and several tax cuts, the discretionary portion of the budget would only account for 14 percent of spending growth. As a share of the economy, health, retirement, and interest spending are even more dominant. Combined, they explain 185 percent of total spending growth. Discretionary and other mandatory spending are both projected to shrink relative to the economy. The biggest budget challenges lie in rising interest costs and the growth of entitlement programs, largely driven by the aging of the population. That suggests policymakers should focus on making Social Security solvent, controlling health care cost growth, and identifying new revenue to keep debt – and therefore interest costs – at bay.